Since the surprise release of his tenth album Kamikaze, Eminem has made more headlines than most rappers do in their whole career. Fans were quick to praise the rapper’s apparent return to form after the generally disappointing 2017 album Revival, welcoming back ‘the old Slim Shady’ – something which he addressed in the first video from the album, for the song Fall. Kamikaze became Slim’s ninth consecutive number one album, breaking a 36-year-old record in the process. Despite its success, Eminem has been criticised for using certain lyrics and messages in the new album. Most notably, the 45-year-old rapper uses a homophobic slur in his track Fall, aimed at rapper Tyler, the Creator. Tyler create nothin’, I see why you called yourself a f****t, b*tch / It’s not just ‘cause you lack attention, it’s ‘cause you worship D12’s balls, you’re sacrilegious. The line sparked outrage, with many people calling Eminem out for the lyric. Justin Vernon, of Bon Iver, whose vocals appear on the track, also distanced himself from the song, saying he wasn’t involved in the song’s production and wasn’t aware of the lyrical content before its release. Was not in the studio for the Eminem track… came from a session with BJ Burton and Mike Will. Not a fan of the message, it’s tired. Asked them to change the track, wouldn’t do it. 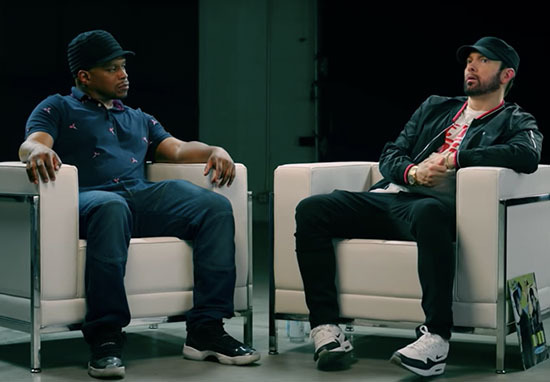 Now, in a recent multi-part interview with Sway, Eminem has opened up about the lyric. I think the word that I called him on that song was one of the things where I felt like this might be too far. The rapper also revealed where the fuel behind the line came from, saying Tyler had tweeted negative things about him, as well as criticising Eminem’s collaboration with Beyoncé on the track Walk on Water. Of course, Slim is no stranger to diss tracks.